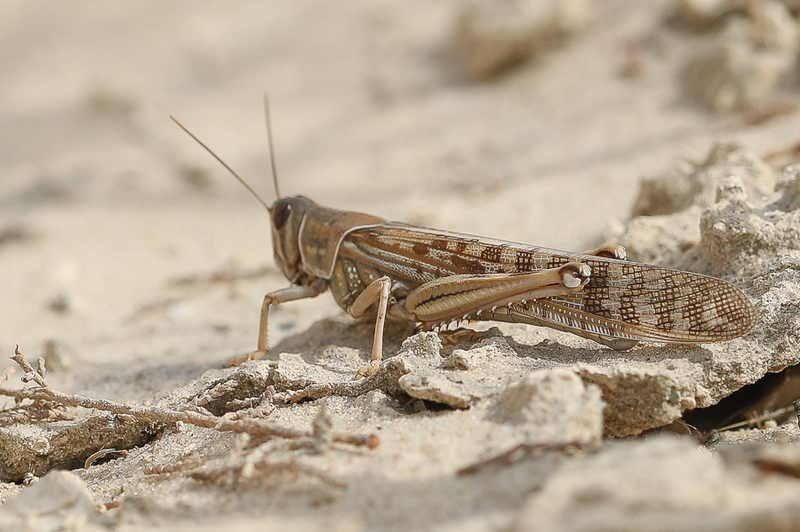 Whilst at Abu Hadriyah I saw a Migratory Locust Locusta migratoria in a small area of vegetation in a vast desert of sand. They are most often seen in pivot irrigation fields where large numbers can be seen but I only noticed one although it was a very small area of vegetation. Normally they occur in small numbers throughout Arabia, but rarely form into swarms. There are two colour forms, brown and green with the green colour forms mainly solitary adult females. Under favourable breeding conditions they can form into vast groups, with young ‘hoppers’ often all marching in the same direction. They are very strong fliers and migratory specimens have been recorded as far away as Great Britain. The migratory locust is the most widespread locust species in the world, and the only species in the genus Locusta. It occurs throughout Africa, Asia, Australia and New Zealand.